The Crimson Canyon NUC was announced and it entered the market without much fanfare. In some ways it’s pretty interesting product though – it’s the second Intel NUC that has a separate AMD Radeon GPU inside. The first one of course was the gaming oriented Hades Canyon NUC which is a significantly more powerful and more expensive NUC than this one. Furthermore, the Crimson Canyon NUC contains Intel’s first 10 nm process CPU, the Cannon Lake i3-8121U. The story with Intel’s 10 nm process has been a long and pretty sad one with several delays and reported problems with the process. At the time of writing the i3-8121U is the only Cannon Lake CPU available and even that is only available in this NUC and some selected laptops. The fact that it does not contain a GPU is also a bit discomforting – was this a product choice or do they have problems with the GPU? In any case, let’s move on and have a look at the new NUC and how does it actually perform. Some unusual design choices here, for sure. Let’s start with the fact that the RAM is soldered on the mainboard with no possibility to expand. You can actually buy this NUC with 4GB RAM as well instead of the 8GB, but I definitely wouldn’t unless there was a very specific use case that required only 4GB or less. For storage there’s a one terabyte conventional hard drive included in the NUC! I had already forgotten how painful it is to start Windows from a hard drive… Finally, there are no USB Type-C ports at all. Full technical product specifications are available here if you’re interested in all of the small details. You might have seen it before – gunmetal grey chassis with a shiny black top cover that collects fingerprints and scratches. This NUC looks like most of the NUCs before. Two USB 3.1 ports in the front. Refreshing change here is a separate HDD LED a bit left from the USB ports. The left side has a full size SDXC card reader and a Kensington slot in case you need to chain the NUC to your desk for some reason. Might be handy in public places. Finally in the rear you’ve got two HDMI 2.0b ports, two more USB 3.1 ports, power connector and a gigabit Ethernet port. I normally like to write a chapter about assembling the NUC and installing the RAM etc. As this NUC is actually delivered with RAM and hard disk installed there’s no real need to pop open the bottom cover. Provided that you’re happy with a mechanical hard drive and making some coffee every time your Windows is booting up. You could either replace the supplied Seagate 1TB hard disk with a 2.5″ SSD or you could install a secondary drive in the M.2 slot. I did copy the data from the HDD to a Kingston 2.5″ SSD and replaced the Seagate with that. You could also install an Intel Optane cache module in the M.2 slot. They’re pretty cheap and work reasonably well according to Jason Hoffman who recently tested one in a Crimson Canyon NUC. 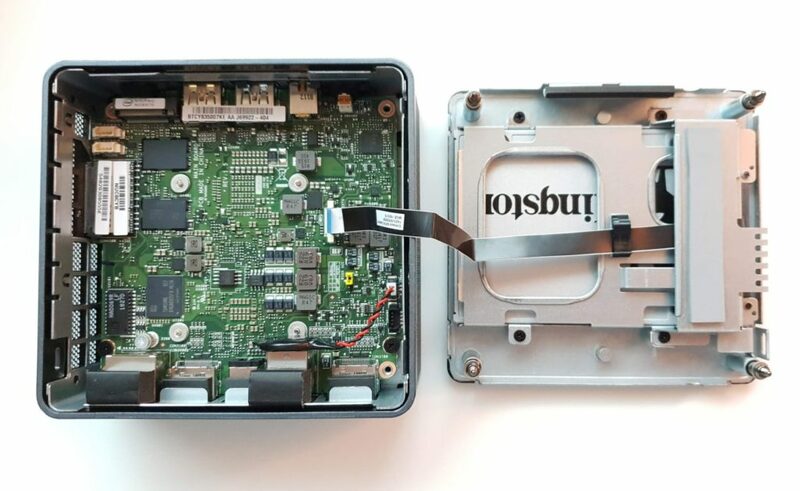 The bottom cover is secured with four screws and the 2.5″ SATA slot is part of that. It’s worth pointing out that the SATA cable is completely different to anything I’ve seen previously and besides providing both power and data in the same cable it’s also long enough which is pretty convenient. You can actually detach the bottom cover and lay it next to the unit on your desk. There’s not much user serviceable parts here. On the mainboard there’s only the M.2 slot that you might be interested in filling. 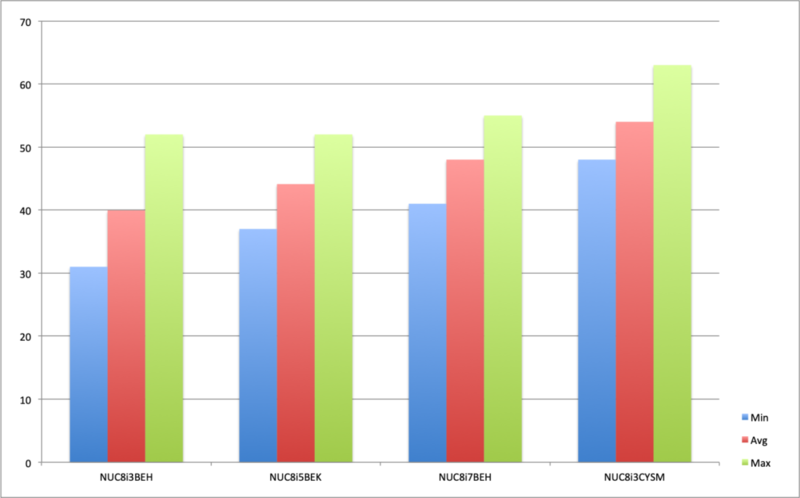 I did run my usual setup of benchmarks with the NUC to test the performance of the NUC. The system comes installed with Windows 10 Home that actually boots up to the desktop in almost 3 minutes from the hard drive. That just won’t do in 2019… I used Macrium Reflect to copy the OS disk onto an SSD drive that was connected through an USB adapter and then replaced the HDD with the SSD. Boot time improvement was significant – it now came up to desktop in 22 seconds from the press of a power button. 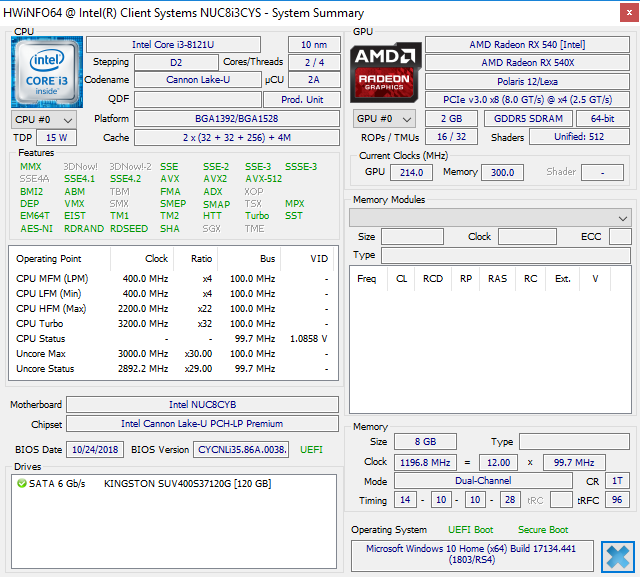 All of the benchmarks below are run with the Kingston UV400 SSD drive in place. 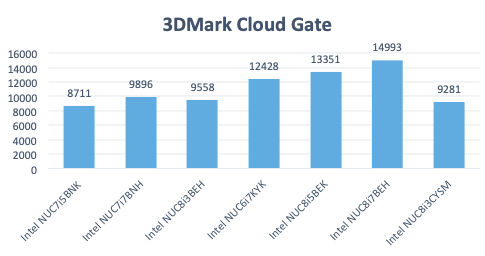 In Cloud Gate test the Bean Canyon NUCs all beat the Crimson Canyon NUC clearly, but as we move forward to the more challenging tests it becomes apparent that the Radeon 540 GPU in the Crimson Canyon is a bit more powerful than the Intel Iris GPUs in Bean Canyon NUCs. 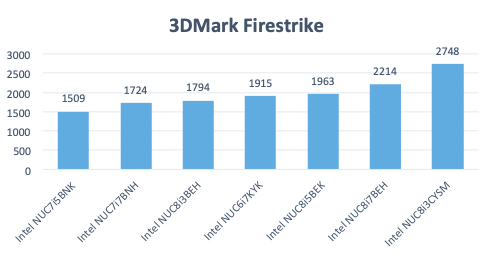 In Fire Strike test this i3 NUC scores 24% better than the i7 Bean Canyon. In the CPUmark test the result is 5222. Full results available here. 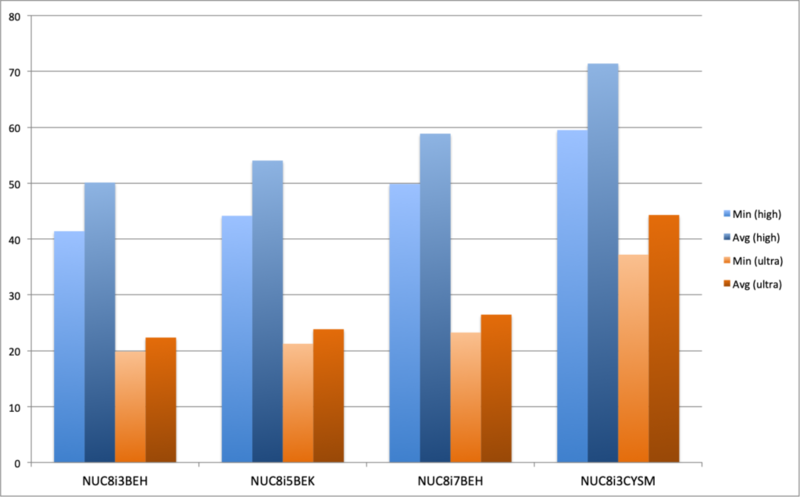 In Geekbench 3 test the NUC achieves a single-core result of 3747 and with multiple cores the result is 7950. This is a bit less than the NUC8i3BEH (Bean Canyon) managed to score (4027/8404). The Geekbench 4 figures were 4170/8289. 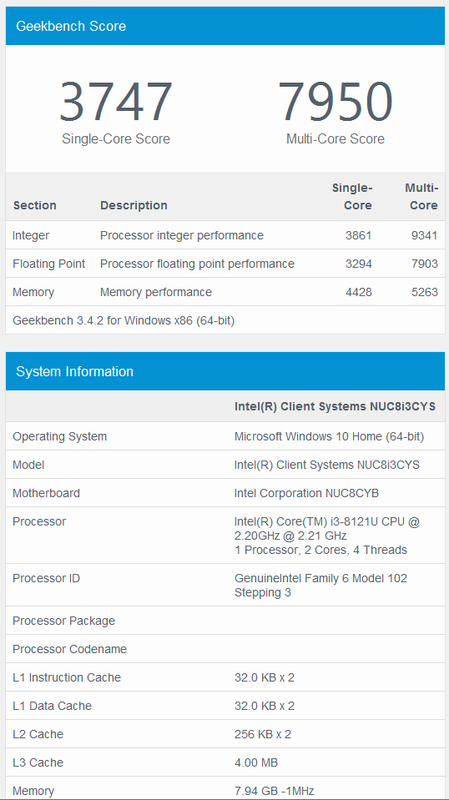 The i3-8121U CPU seems to be a bit slower when compared to the i3 CPU in the Bean Canyon NUC. In a way that is expected as we are looking at a 15W TDP vs. 28W TDP here. However, the Cannon Lake CPU does not include a GPU so I’m not entirely sure that we can compare them directly. The GPU on the other hand seems to do its job. 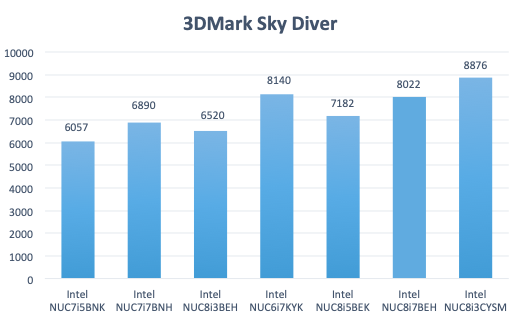 This Crimson Canyon i3 NUC beats the Bean Canyon i7 NUC in the benchmarks that resemble gaming and as we can see later, also in actual games. It also beats the Skull Canyon NUC in the gaming tests which is not bad actually. Intel does market this NUC for gaming and it has been available in a bundle with few titles. I did try a couple of games on it and as I did do so also on the Bean Canyon NUCs it’s only natural to compare these. 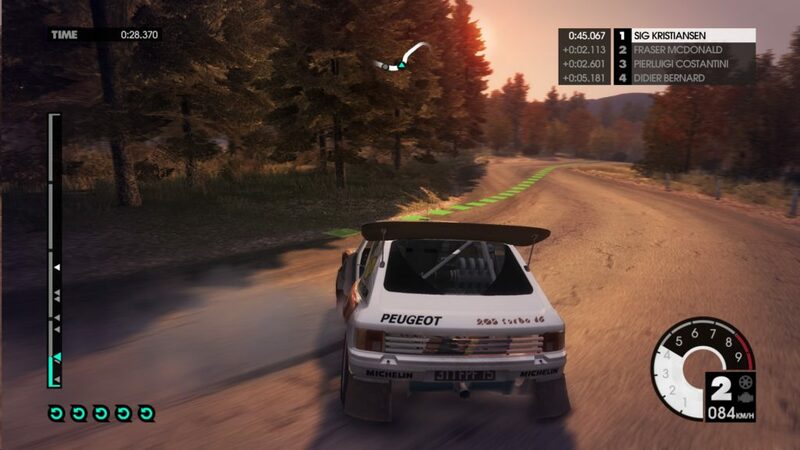 Dirt 3 is an older rally game, but when played on Full HD resolution with ultra level of details it’s already giving the NUC a run for its money. It’s also got a very handy benchmark feature that makes it easy to collect the performance figures. The game was completely playable on full HD resolution and high or ultra preset. The minimum frame rate with high preset was 59.5 and average frame rate was 71.4. On ultra preset the numbers were 37.2 and 44.3. It’s worth noting that these numbers are a good 20 to 70 percent better than the fastest Bean Canyon can do. 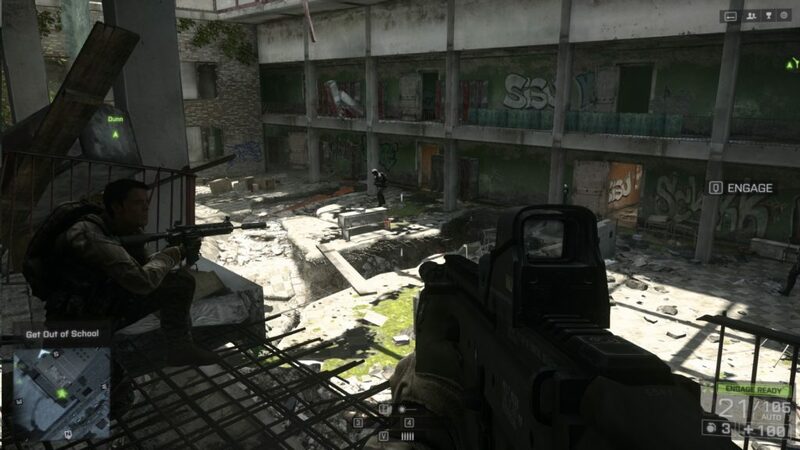 BF4 is a first person shooter from a couple of years back as well. It’s not spectacularly beautiful by today’s standards, but it still can be a lot of fun. And it’s just the type of game that the NUC is able to run pretty nicely. This doesn’t present much of a challenge to the Crimson Canyon NUC. The min/avg/max frame rate was 48/54/63. This beats Bean Canyons again by a good margin. 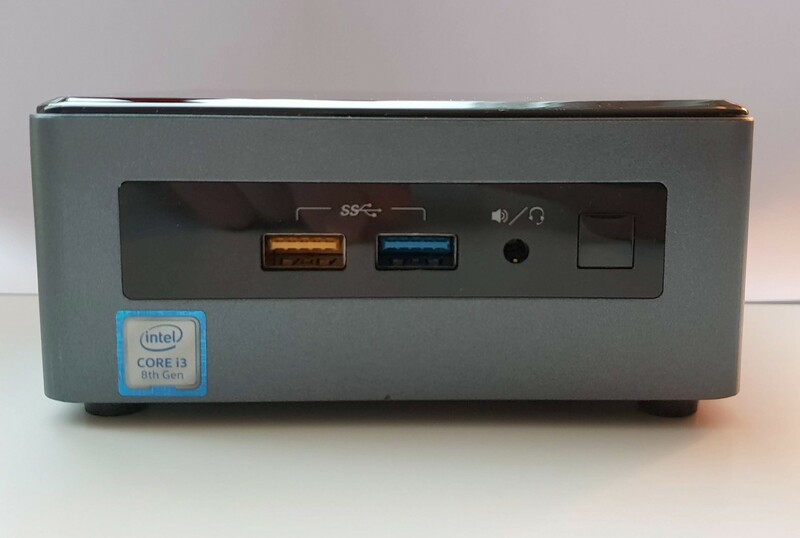 In a way this NUC is interesting if you want to build a miniature HTPC but use something’s else than an Intel GPU. The Radeon GPU does support HDR and does hardware decoding of most popular formats although it has to be said that the Intel GPUs fare better when it comes to VP9 decoding for example. The latest beta versions of LibreELEC 9 provide support for the Radeon GPU and should work ok. Of course, running Kodi under Windows should be quite effortless. All in all, it does feel a bit like a technology demo (“Look, we have a working 10nm CPU in a mainstream product!”) that is deliberately restricted or unfinished in some other areas. The leaked NUC roadmaps for the next year would seem to indicate that we won’t be seeing more Radeon GPUs in the NUCs. 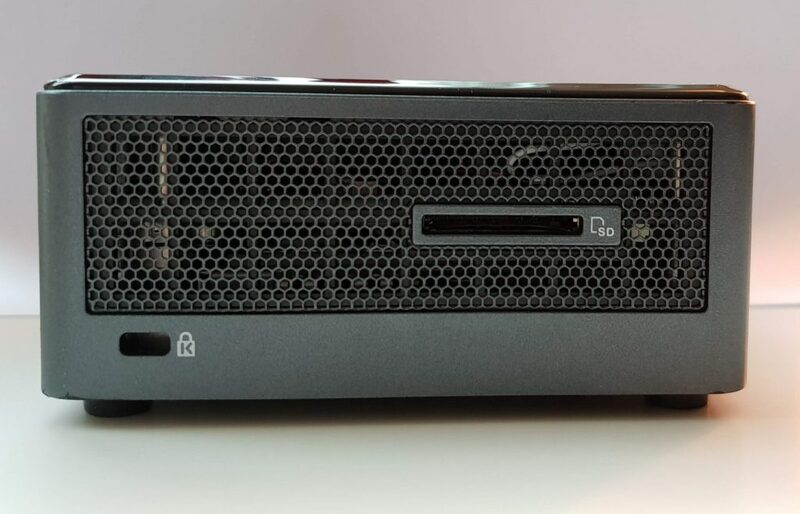 There’s upcoming Islay Canyon NUC that’s basically an i5 version of this NUC, but that will have a Radeon 540 GPU as well. It does come prebuilt and with Windows 10 preinstalled, but I feel even that selling point has been negated with the inclusion of the rotating disk that’s probably getting replaced by an SSD drive in most cases. This means both assembly work and installation work is needed – not that dissimilar to the case with a full barebones NUC kit. And you do get the advantage of having expandable RAM if you go that route. 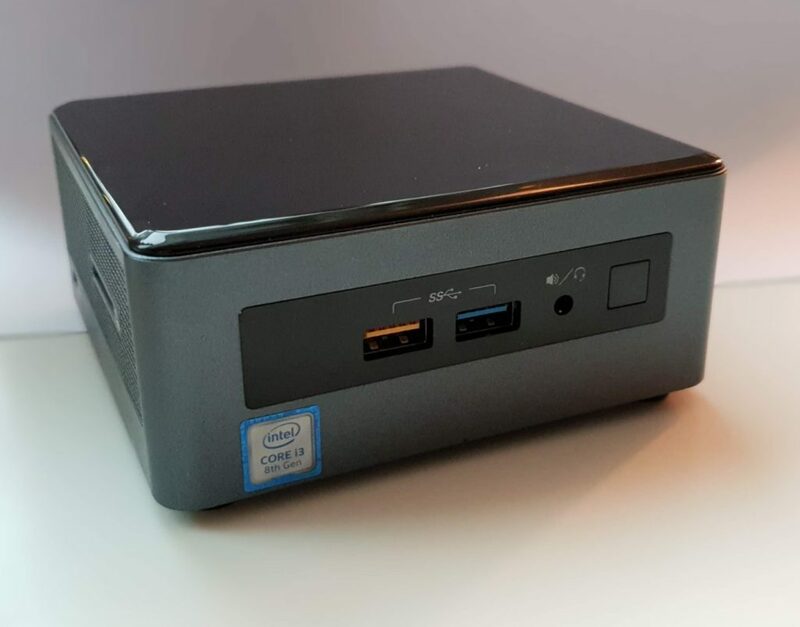 This NUC was borrowed to me by Simply NUC, who do sell this NUC also preconfigured with an SSD drive, in case you’re interested in a hassle free out-of-the-box experience. Yes, it’s better for gaming than the Bean Canyon NUCs are, but it’s still not that hot for that purpose either. 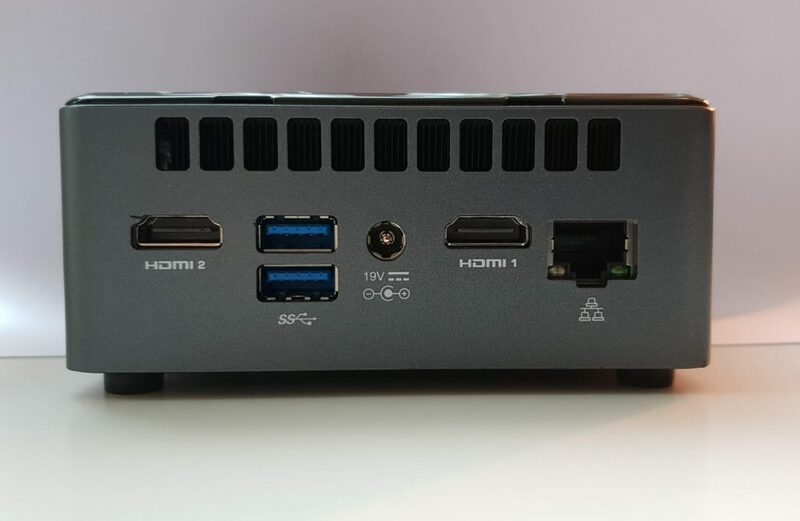 There probably are some use cases where this NUC excels and if you’re using this NUC for a specific purpose I would be happy to hear your opinion below in the comments section. Hello! I’ve been waiting to hear your thoughts on this unit, and checking back daily! I suspect that you need an Intel Optane stick to really get the most out of Crimson Canyon, since this is a perfect use case. Considering the 16GB stick is going pretty cheap nowadays, I’m really surprised one isn’t included as standard. Would be interested to see if that makes a difference to your benchmark tests, too. Can I ask, does the Crimson Canyon have the same improvements to cooling/fan noise as the Bean Canyon units? Ok, my mistake looks like same GPU, Radeon 540 vs 540X is the same ? I see it’s fixed now. 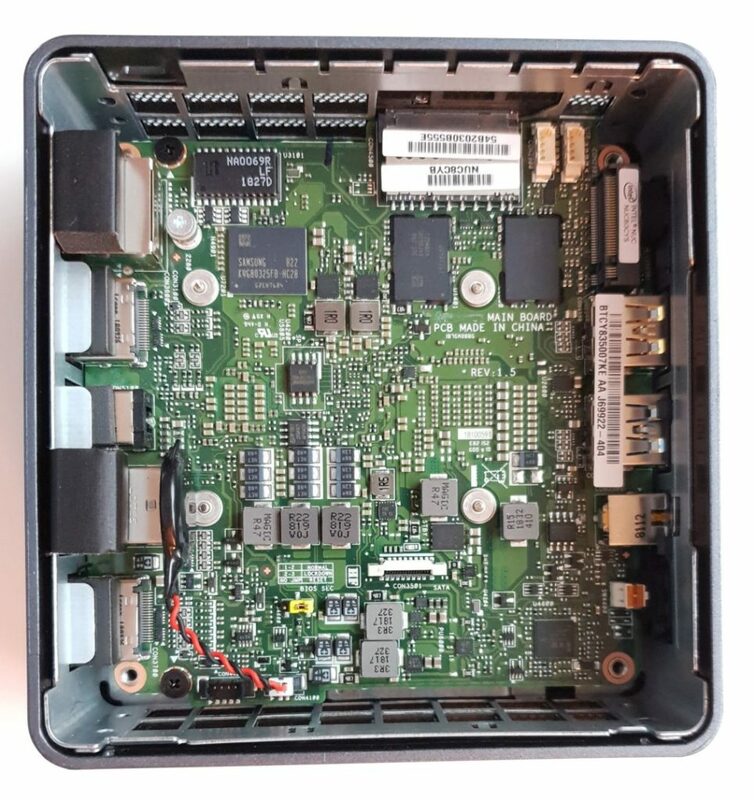 🙂 Keep with good work, I like this NUC blog a lot, but for me NUC are to expensive to play (Currently started to explore Raspberry Pi and I love this board). I read soldered ram… Next! Why couldn’t we just get Bean Canyon + GPU? Why this junk like soldered RAM and no USB-C? Those 2 things push this NUC in to “do not buy” territory. The HTPC section is very short this time… Would be nice to see some more detailed test regarding, specially with 4K / HDR video playback and up and downscalling tests (with preferable some MadVR boost). And of course the LSPCON issue. I guess based on the dedicated GPU, there is no LSPCON in this NUC. So no issue with HD-Audio and s3D playback. Right? Mr. Review man, thx for all, but there is temperatures? I can’t buy it until I see the temperature during the stress tests. No one writes about this devices. Who will share? I guess it also have the new AVX512 extensions? Cannon lake (not only Ice lake) was supposed to get some interresting new ISA. One thing that would be really nice if you can add to the review is power consumption. It would be interresting to see if 10nm+soldered ram can make a difference, even though it have a Radeon chip. I’d like to know the performance of this machine running dota2. Thanks for the great review, I went on and bought one yesterday from amazon for $429 which is a good deal, also got the Samsung 970 EVO 500GB for it! Can anyone advise if FIFA19 is playable smoothly on this? Would much appreciate to know about it. 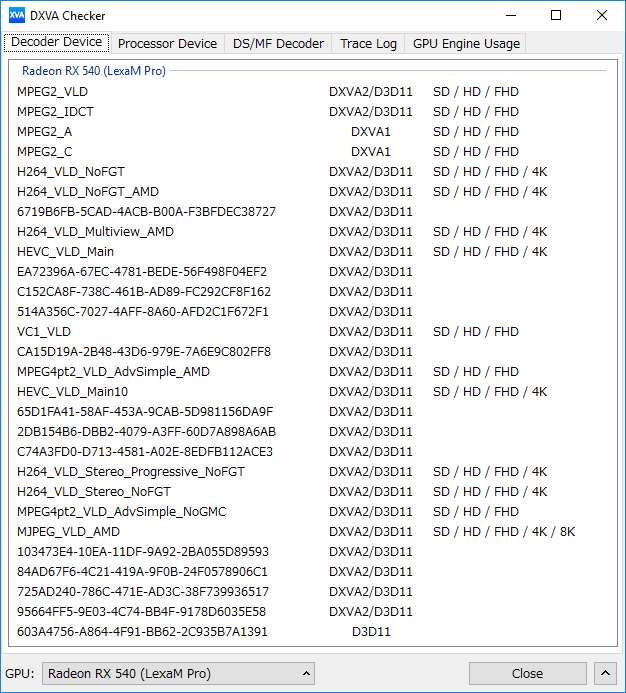 Also how can I transfer the Windows to fully boot on the SSD/Samsung 970 EVO?